I am arriving at Fiesta Friday a bit late today, with my tangy – sweet creation in hand. Angie, our host from The Novice Gardener, has moved our weekly soirée to a new venue. We are all excited that we now have a space where we can kick up our heels, virtually; and not have to worry what the neighbours are saying when we party until the wee hours of the morning. If you haven’t yet joined this delicious virtual blog party, please come and check it out! We always love newcomers! 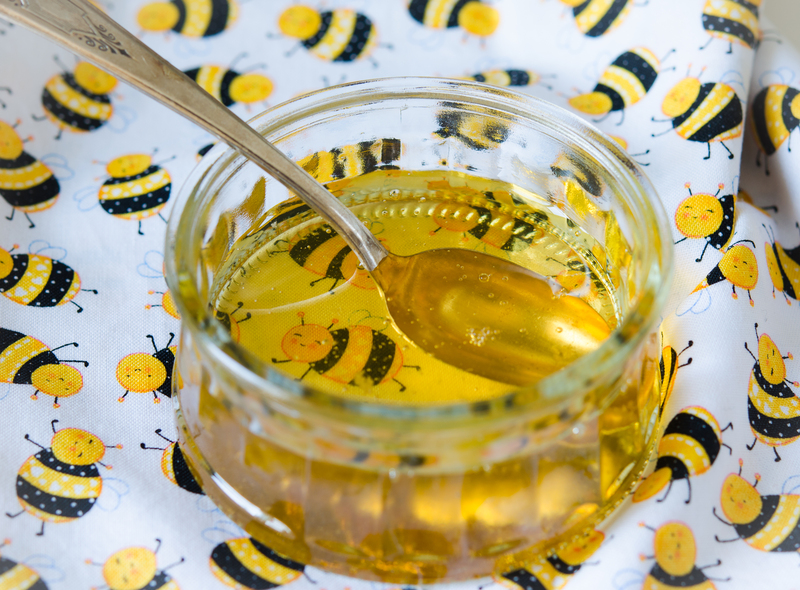 Use a good quality honey for the nicest flavour. Place the lemon peel and water in a small bowl and allow to stand for 10 minutes or until the lemon has softened. Drain, reserving the water. Place the peel in the base of a lightly greased, shallow 26cm round cake tin, lined with baking paper, and set aside. Place the butter, sugar, ¼ cup of the honey and the lemon rind in the bowl of an electric mixer and beat for 8 – 10 minutes until pale and creamy. Scrape down the sides of the bowl and add the lemon juice and eggs, one at a time, beating well after each addition. Add the flour, baking powder and almond meal and beat on low until just combined. Spoon the batter into the prepared tin and spread evenly. Bake for 40 – 45 minutes until cooked, and tested with a skewer. Allow to cool in the tin for 5 minutes before turning out onto a wire rack to cool completely. Place a tray under the rack and drizzle the cake with the remaining honey. While the cake is cooling, place the icing sugar and 1 tablespoon of the reserved lemon water in a bowl and stir until combined. 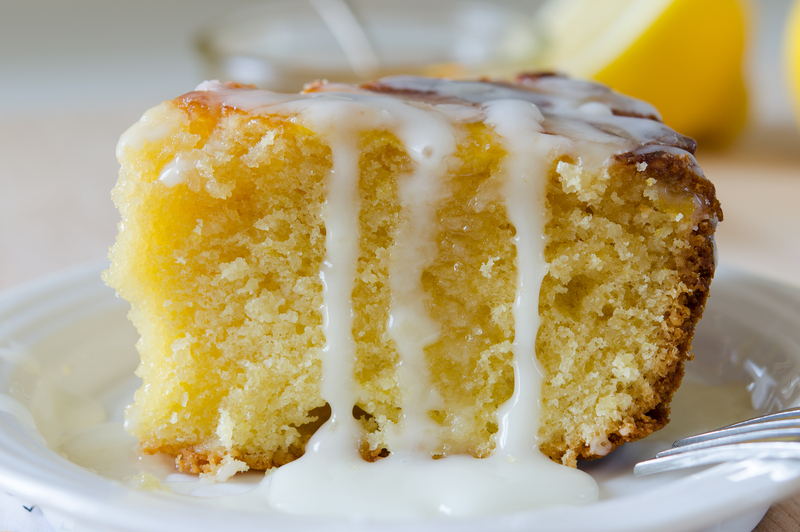 Drizzle the lemon glaze and the extra honey over the cake and serve warm. 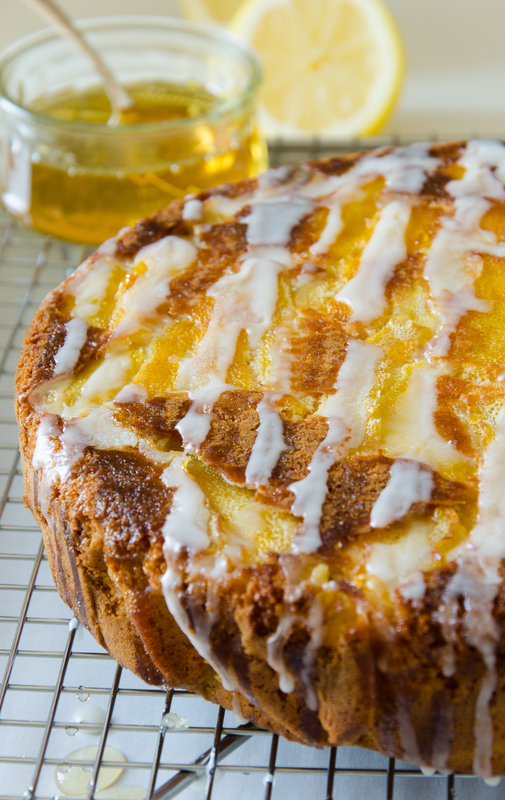 Drizzle with extra honey and a citrusy glaze. Yum! That is my kind of cake! Looks fabulous, and love the flavours. Using the rinds in strips is something I must try. Have a lovely weekend. Sounds like wonderfully flavored & easily doable cake! I love baling with almond meal, it gives everything a delicate, warm undertone,I can imagine it is a great match with the lemons! I thought the same thing too when I saw the recipe and it is just a great combo! This sounds wonderful, Julianna!! I want to make these into little cupcakes! Perfect for Spring, don’t you think? Love that bumblebee plate! Girl, you’re not late at all! The party is JUST starting ! This cake looks delish! Thanks so much for sharing! So moist and delicious looking cake. Love the sight of it! Lemon and orange cakes are my favourites ! and loaded with almond … delicious ! I am with you! Citrus is probably my most favourite flavour for desserts! So many possibilities too! Such a wonderful cake! …with some of my favourite flavours!!! So glad, Skd! My kind of cake too!! Really glad you think so! Thanks Amanda, that’s what I thought too, and why i felt compelled to make it and share it with you guys! Oooo how lovely, I’ve seen quite a few lemony cakes these past few weeks, perhaps enticing spring to appear? I have bookmarked this one, and can’t wait to try it. Oh, Judi, that would be so amazing! Lemon and lavender are heavenly! Gorgeous cake, Julianna! I imagine the lemon gives it a delicious jolt of flavor. 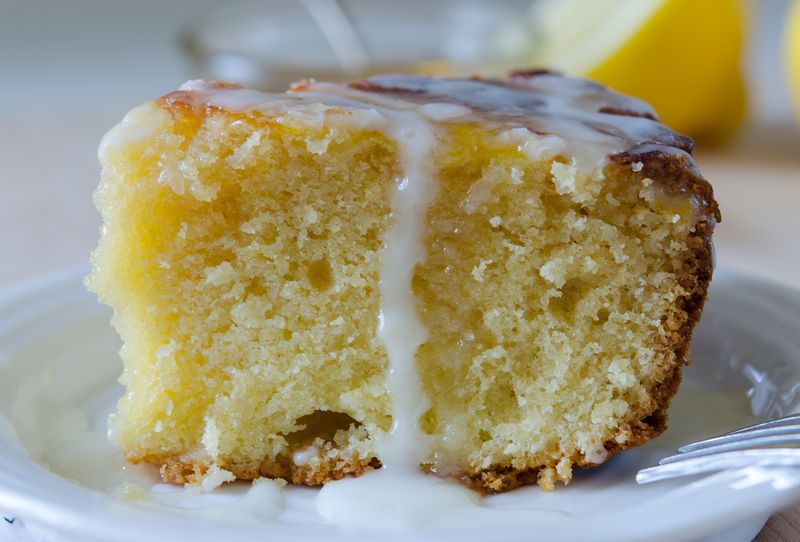 The honey icing must offer a satisfying sweet balance to the tangy lemon. 😛 You need to have friends visit more often…you may not bake often, but you sure do it well!! Thanks for sharing your yummy cake at Fiesta Friday! What a gorgeous, moist cake! Love the flavors Julianna! Yum!! Thanks Naina! I think I will have to make cakes more often!! looks absolutely delicious, the texture of the cake looks so moist, fluffy and tender, pinned for later! You don’t bake often, but looking at this cake you should do it more often! I had a lemon and almond dessert a couple a weeks a good… it was so good!!! Thanks for sharing! It’s my pleasure to share this with you, Margy! Lemon and almond is such a great combination, don’t you think? I’m definitely going to have to try this cake! I’m already drooling!! I’ve been thinking about making lemon cake recently, I haven’t had it in so long but I do love it, and this recipe looks great. Lots of lemon and almond too, can hardly go wrong. I am so drooling…this looks so luscious Julianna!! Oh my this cake looks crazy good… lovely teaming. .. This made my mouth water on the spot. Especially with warm weather coming soon, lemon is the perfect accent. Yum! I’m not much of a dessert fan but this looks so yummy! I do love lemon “anything!! !” and that blend of flavors sounds like it would be delish. Well now doesn’t this look divine?! Along with so many of your other recipes, glad I came across your blog! Just the title alone makes me hungry for some of this!! WOW. Your pics seal the deal though- definitely pinning this, perfect for spring too! This looks so delicious and moist! I just LOVE honey combinations, but never tried it with lemon! will certainly do it! Looks awesome. Do you have any easy German Apple Bundt cake recipes? My aunt used to make one with cinnamon sugar surrounding the apples, but she has since passed away.